Bulbs ovoid, 3-5 × 2-3 cm, tunic pale brown. Leaves 3-4; blade flat, 20-45 cm × 5-12(-15) mm, glaucous. 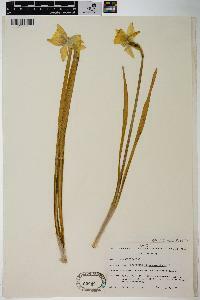 Inflorescences 1-flowered, 25-50 cm; spathe pale brown, 2-3 cm, papery. Flowers fragrant; perianth white, 5-7 cm wide; perianth tube 1.5-2 cm, tapering abruptly to base; distinct portions of tepals erect to spreading, yellow, often twisted, oblanceolate, 2.5-3.5 × 1-1.5 cm, apex acute; corona yellow, tubular, 30-35 × 15-25 mm, apex flared and ruffled; stamens uniseriate, exserted to ca. midlength of corona; style exserted 2-5 mm beyond anthers; pedicel 5-10 mm. 2n = 14. Flowering spring. Roadsides, fields, waste places; 0--1000 m; introduced; B.C., Nfld. and Labr. (Nfld. ), Ont. ; Ala., Ark., Conn., Ga., Ill., Ind., Ky., La., Md., Mass., Mich., Miss., Mo., N.J., N.Y., N.C., Ohio, Oreg., Pa., R.I., S.C., Tenn., Tex., Va., Wash.; w Europe; expected naturalized elsewhere. Narcissus pseudonarcissus is the most variable species in the genus and includes many elements that sometimes have been recognized as separate species (e.g., H. W. Pugsley 1933). An old cultivated variety, 'Telemonius Plenus,' with highly doubled flowers, commonly persists, although it does not reseed. Natural hybrids between N. pseudonarcissus and N. poeticus (N. ×incomparabilis Miller) have 1-flowered inflorescences and yellow flowers with the corona about half as long as the distinct portions of the tepals. They are known to persist in Kentucky, Louisiana, Mississippi, New Jersey, New York, North Carolina, Oregon, Pennsylvania, Texas, and Virginia. Natural hybrids between N. pseudonarcissus and N. jonquilla (N. ×odorus Linnaeus) have 1-4-flowered inflorescences and bright yellow flowers with the corona one-half to three-fourths as long as the distinct portions of the tepals. They are known to persist in Louisiana, South Carolina, Texas, and Virginia. Perennial herb with a bulb flowering stem 20 - 40 cm tall Leaves: three to four, 20 - 45 cm long, 5 - 12 mm wide, linear, flat, with a waxy coating (glaucous). 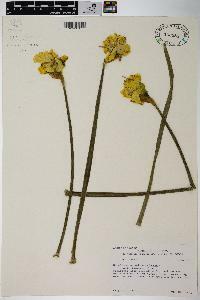 Flowers: solitary, yellow and/or white, 4 - 7 cm wide, with six pointed tepals and a 1.5 - 2 cm long fringed tube. Tepals ascending or reflexed and fused at the base. Stamens six. Fruit: a capsule with numerous seeds. Habitat and ecology: Introduced from Europe. Commonly planted and escaping to waste places. It may also persist in places where it was once cultivated. Notes: Narcissus species and many of their hybrids and cultivars are among the most popular of spring flowers. Etymology: Narcissus is the Greek name honoring the young man who become so entranced with his own reflection in a pool of water that the gods turned him into a flower. Scape 2-4 dm, about equaling the lvs; fls yellow, solitary, horizontal, 4-6 (in cult. to 10) cm wide; corona about as long as the tep, usually frilled at the margin; 2n mostly =14, 28. Native of Europe, occasionally escaped from cult. into moist meadows in our range. Spring.